16 Vocal warm-ups and exercises with vocal demonstration and piano accompaniment. Voice Teacher/singer/songwriter Carey Yaruss guides you through the vocal warm up that she uses in her private voice lessons. There was no hesitation when I saw that Carey Yaruss had this album for sale on Cdbaby! I purchased it the moment I saw it! I'm so happy that I did. I needed vocal warm-ups to come with me where ever I go! In the house, In the hotel room, While on tour, In my Dressing Room, In the Car! Thanks to Carey I have that now! 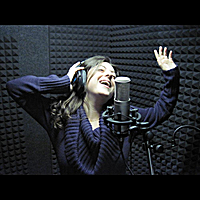 Carey is a trained vocalist from Boston Conservatory of Music and she knows her stuff and I trust in her product and I recommend it to anyone out there needing a vocal warm-up or a vocal lesson. Thank You Carey! Buy this Download you will be so Happy you Did!